Attic ventilators allow you to remove stifling and super-hot attic air, helping to improve the comfort of your home regardless of whether it is air-conditioned. Attic ventilators can help to decrease the cost of air conditioning, help to prevent ice dam formation, increase the longevity of your roof's life, as well as remove potentially damaging moisture from your attic. Trapped attic air can sometimes exceed 150° in temperature. A quality attic ventilator will help to keep your home energy efficient. The attic ventilators that we examine here are designed to lower the temperature of hot attics, working to draw cooler outside air in while pushing all of the super-heated air outside. In the winter time, attic ventilators will facilitate the natural flow of air from the outdoors to keep it cool, which will help to decrease the chances of ice damning- when snow melts off the roof and then re-freezes in the gutters, damaging the roof. Let's take a look at five of the best-selling ventilation units on the market today. Broan has been around since 1932 and they have been making residential ventilation products since that time. The Broan 353 Gable Mount 120-Volt Powered Attic Ventilator, 1020 CFM is one of their most recent ones. An attic ventilator can be extremely important since often the air that is found trapped in an attic can reach as high as 150 degrees and you need something that can remove this super heated air. An air ventilator is something that can help lower the temperature of your overall home even if you don’t have air conditioning. 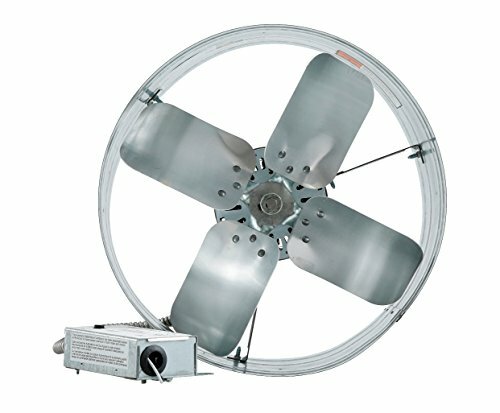 Some of the features of this attic ventilator is a nicely balanced 14 inch diameter metal blade that allows for maximum air flow. Users like the fact that it operates automatically and has an adjustable thermostat that is built-in with a thermally protected and permanently lubricated motor. Users of this attic ventilator like how easy it is to install taking less than 30 minutes before it was up and running. The only thing a few users had to say negative against this unit was that they thought it could run a little quieter and that it didn’t come with mounting brackets. The Cool Attic CX1500UPS Power Gable Ventilator Fan is an attic ventilator that can cool up to as much as 1,850 square feet. If you have a large attic this could be a style that might fit the bill to get large attics cooled down. One of the nice features that many users like is that it has an adjustable thermostat that has its own built-in safety features. Others users thought that the 14 inch fan on this attic ventilator worked well with its 600 square inch intake. 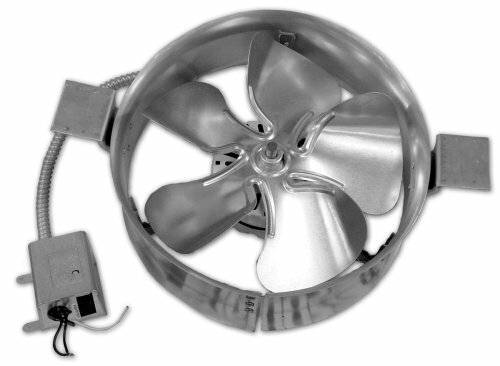 Some users however do not like the fact that this air ventilator fan and motor are not self-lubricating and the instructions say to lubricate often but did not say how you are to do such a thing. Users do like the fact that this particular unit runs quieter than a lot of others on the market even though it is not as expensive as some others the motor works great and almost sound free. Another thing that many users really enjoyed about this attic ventilator is that it was both easy and quick to install. The Air Vent Gable Attic Ventilator is an attic ventilator that can cool off an area of about 1500 square feet and that’s a pretty good sized area for the average home. 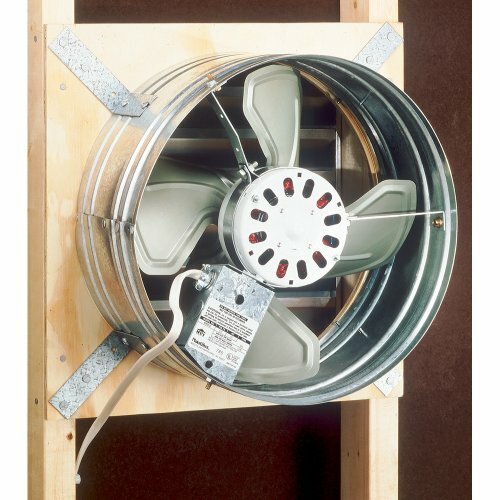 This attic ventilator is compact in size and very lightweight– weighing just eight pounds overall. Users of the attic ventilator like the thermostatically controlled fan especially for attics that have very limited ventilation in them. The temperatures in an attic in the summer can soar and this attic ventilator is something that helps to control that problem during hot summer months. Some users didn’t like the fact that the thermostat is kept in a metal housing because it takes the thermostat a little while after the target temperature was reached for the fan to kick on and cool off the thermostat. Some users of this attic ventilator have reported that this particular unit is louder than others they have had in the past. Some users also didn’t care for the blades all that much and thought they were flimsy. One of the features of this attic ventilator by iLIVING is the fact that it comes with both an adjustable thermostat and humidistat. Users really like these two items that are built into the unit. Another nice feature that many of its users like is that this particular attic ventilator can actually cool up to 2,300 square feet of attic area and that’s a significant amount of space being cooled off. 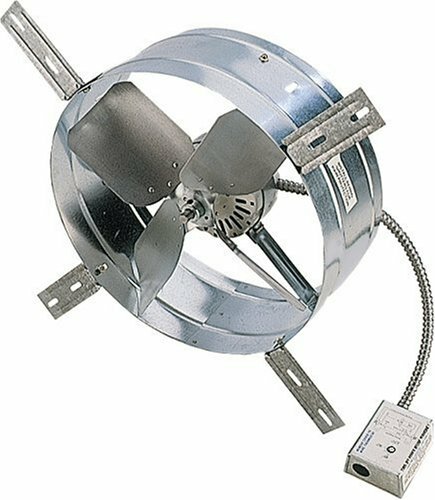 The housing for this attic ventilator is very sturdy and built of galvanized steel which a lot of its users like because they don’t have to worry about the durability of the unit as much. One other thing a lot of users like about this unit is that the motor is protected by the thermostat and that it is also lubricated permanently so there is no need to have worry about lubricating it yourself. One other thing users didn’t like about this attic ventilator is that it is not easy for the average person to install and might need professional installation for some users. The Lomanco 1800 Addavent Gable Mount Ventilator is an attic ventilator that is constructed of all-aluminum, which is a nice feature a lot of users tend to like. It has balanced blades that are pitched to facilitate especially smooth operation with a high volume of hot air removal. Another nice feature many users like about this unit is that it has a factory set thermostat that is adjustable and it automatically will turn on when the temperature hits 100 degrees and will automatically turn off when the temperature reaches 85 degrees. A nice feature of this attic ventilator is that the thermostat has a “push to test” button on it. Users also like the unit because it can be installed horizontally or vertically making it easier to find a good spot for this attic ventilator in the attic of any home. 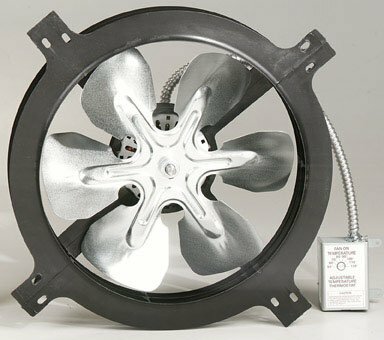 Some users, however, have discovered that the unit can be loud at times and if it needs to be serviced it is difficult to do so since it is built only to be serviced from the inside and not from the outside in order to get to the fan. A quality attic ventilator will help to make your house more energy efficient and comfortable. Once you have one of these units up and running, it's likely that your air-conditioners will not have to work as hard and you will not have to pay as much in energy bills. All of the super-heated air that has become stagnant and humid will be drawn out and replaced with fresher and dryer air which will help to fight off moisture damage. As you can imagine, in the summer months, the sun is constantly saturating your home's roof with heat, and your shingles correspondingly heat up to incredibly hot temperatures. Your lumber and rafters and anything else that you have stored in your attic will suffer the effects of this tremendous heat- all of which speaks to the importance of proper attic ventilation. In addition, all this attic heat can see through the insulation or even your air conditioning ducts to infiltrate your homes living areas- this will mean that your air conditioning system is not going to work as effectively cooling or controlling the home's temperature. 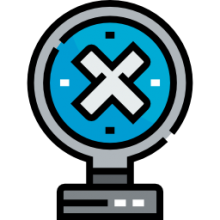 Calculating the exact energy savings figures will depend on different variables from your roof's color to whether you have trees on your property that shade your home, to amount of insulation installed in your attic as well as the general efficiency of your air conditioning system. If you are considering purchasing an attic ventilator, check out the different attic ventilation units that we have examined on this page and make sure that any attic ventilator that you buy meets the specific criteria of your home's ventilation requirements.